000004:  C=404      1 L      121 W    1636 Ch   "test123"
000003:  C=404      1 L      121 W    1636 Ch   "456"
000006:  C=404      1 L      121 W    1636 Ch   "admin123"
000005:  C=404      1 L      121 W    1636 Ch   "admin"
000001:  C=404      1 L      121 W    1636 Ch   "abc"
000002:  C=404      1 L      121 W    1636 Ch   "123"
dirwalk         | Returns filename's recursively from a local directory. file            | Returns each word from a file. 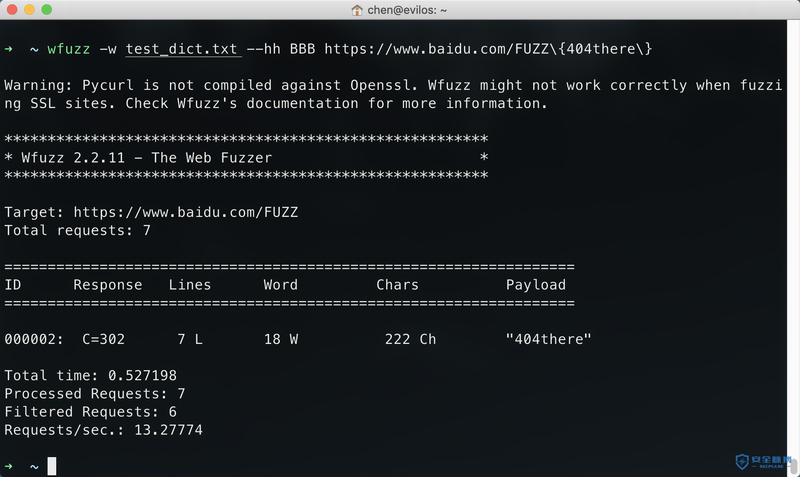 burpstate       | Returns fuzz results from a Burp state. 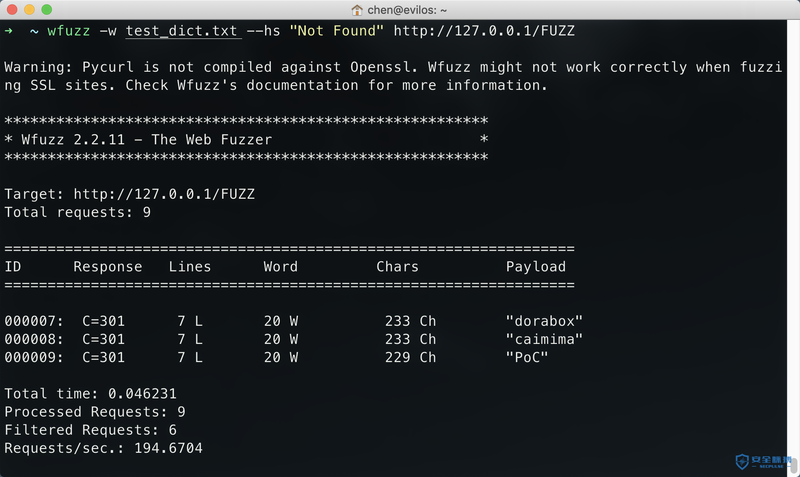 wfuzzp          | Returns fuzz results' URL from a previous stored wfuzz session. ipnet           | Returns list of IP addresses of a network. bing            | Returns URL results of a given bing API search (needs api key). stdin           | Returns each item read from stdin. list            | Returns each element of the given word list separated by -. hexrand         | Returns random hex numbers from the given range. range           | Returns each number of the given range. hexrange        | Returns each hex number of the given hex range. permutation     | Returns permutations of the given charset and length. buffer_overflow | Returns a string using the following pattern A * given number. iprange         | Returns list of IP addresses of a given IP range. 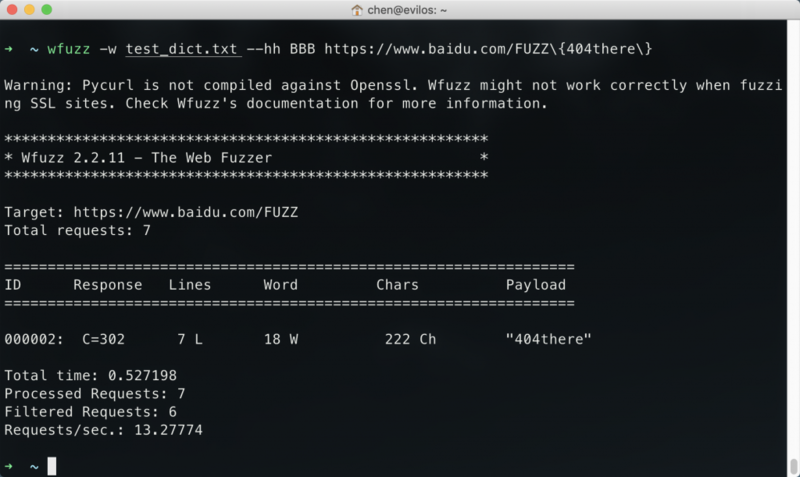 burplog         | Returns fuzz results from a Burp log. autorize        | Returns fuzz results' from autororize. e.g. wfuzz -z help --slice "names"
Summary: Returns possible usernames by mixing the given words, separated by -, using known typical constructions. + name: Name and surname in the form of name-surname. Summary: Returns each word from a file. Returns the contents of a dictionary file line by line. autorize        | 获取autorize的测试结果Returns fuzz results' from autororize. bing            | 获得一个使用bing API搜索的URL列表 (需要 api key). product | Returns an iterator cartesian product of input iterables. zip     | Returns an iterator that aggregates elements from each of the iterables. -f filename,printer         : 将结果以printer的方式保存到filename (默认为raw printer). --req-delay N            : 设置发送请求允许的最大时间，默认为 90，单位为秒. --conn-delay N              : 设置连接等待的最大时间，默认为 90，单位为秒. --script-args n1=v1,...     : 给脚本传递参数. ie. --script-args grep.regex="<A href=\"(.*? )\">"
-z payload            : 为每一个占位符指定一个payload，格式为 name[,parameter][,encoder]. 编码可以是一个列表, 如 md5-sha1. 还可以串联起来, 如. md5@sha1. -H header              : 设置用于测试请求的HEADER (ex:"Cookie:id=1312321&user=FUZZ"). 可指定多个HEADER. 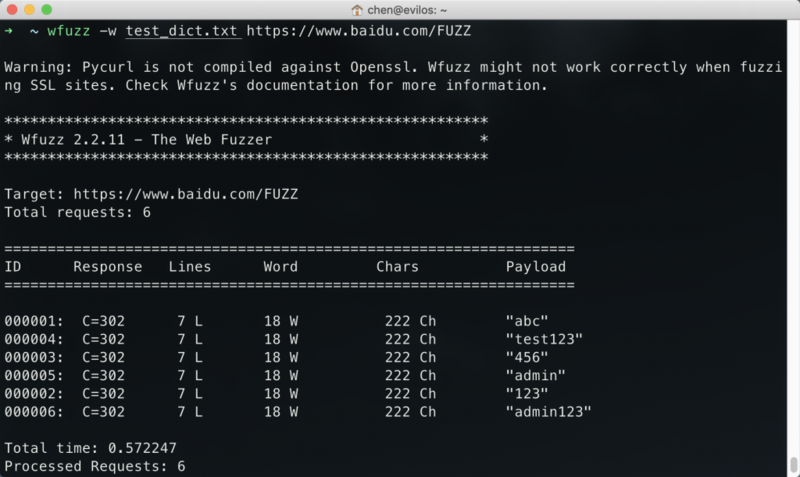 --basic/ntlm/digest auth    : 格式为 "user:pass" or "FUZZ:FUZZ" or "domain\FUZ2Z:FUZZ"